Season 2 of Orphan Black, starring Tatiana Maslany, reviewed. The return of the incredible Tatiana Maslany on BBC America’s Orphan Black. Recently I read about a panel on Orphan Black, BBC America’s fun, cheeky, haphazardly plotted series about a group of women who discover that they are clones. As one does while reading, I hazily visualized the scene: an audience in folding chairs looking up at a stage packed with performers and the show’s creators. When I finished reading, I realized that what I had been picturing was all wrong: I had been imagining many, many actresses crammed on stage, when, actually, there was only ever one. Orphan Black, which begins its second season this Saturday, is a showcase for a staggeringly great performance from Tatiana Maslany, who plays every one of the show’s clones with such precision and specificity it can be hard to remember she is just one person. Before I had started watching Orphan Black and was just hearing wild praise for Maslany’s performance, I figured that there had to be something over-the-top about it. Come on: Maslany plays, among others, a British petty criminal; a violent and abused survivor of a Ukrainian religious cult; a chipper, steely housewife; a thickly accented German; a ruthless corporate clone with a severe blond bob; and a soothing, dreadlocked, lesbian scientist. On the basis of accents and wigs alone, this array of characters had me in mind of something as broad as Big Momma’s House. But Maslany never goes big when she can go small. Sarah Manning (the petty criminal), Alison (the housewife), and Cosima (the scientist) are so well-developed they could each anchor a series, even though the feisty Sarah is Orphan Black’s actual protagonist. All three characters feel unique, not through some showy shorthand, but because they have distinct psychologies, mannerisms, and line deliveries. The performances are so exacting that Maslany can play, say, Sarah impersonating Cosima without ever confusing us as to who is whom. Maslany’s performance is, however, a bit like truffle fries arriving in a Happy Meal: It is much more sophisticated than everything else around it. 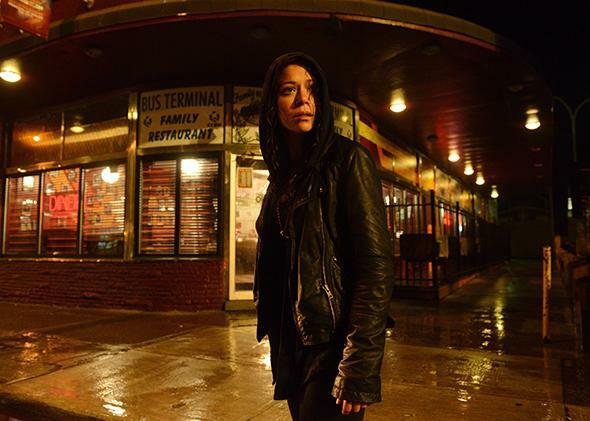 Orphan Black has a decidedly B-TV vibe. With the exception of Sarah’s foster brother Felix, a louche, fey sweetie pie played by Freddie Mercury lookalike Jordan Gavaris, the other characters on the show are unmemorable. It’s a Canadian production that films in Toronto and airs on BBC America, but the city where the show takes place is left intentionally generic. And the plot unfolds with the sort of roller-coaster abandon that suggests the creators are making up some of it as they go along. The show began with Sarah learning she was a clone and swiftly took on every conspiracy element imaginable: nefarious scientific corporations, fundamentalist religious cults, the military, the underground. All of this does very little to diminish the thrill of the ride, but it’s possible the whole thing ends in a messy crash. Underneath the churning plot, Orphan Black does take on some heady themes. It is a show about female bodies being used as objects, products, property. All their lives, without their knowledge, these manufactured women have been closely guarded and monitored. Most of them can’t procreate. Do the clones have some purpose beyond being human? Are they freaks, or are they the future? Are they, in their very genetic material, being controlled? Does someone “own” them? As the new season begins, Sarah’s daughter is missing, and she will do anything to find her, but she’s also constitutionally unwilling to permit the previously mentioned corporation (or anyone else) to control her. Cosima, meanwhile, does not have this freedom, because she’s sick. Some of the clones have a genetic lung defect—oops!—so she knowingly works with that same corporation, and the woman assigned to watch over her, in hopes of getting answers. And Alison, the high-strung suburban housewife who is Orphan Black’s funniest and most tragic character, leans on pills and alcohol, trying to get out of her body with the narcotics closest at hand. These women, and all the other active clones, share a face, a body, and genetic material, but they are nothing alike. Orphan Black makes an extreme case for nurture over nature. The women are made of exactly the same DNA, but they could not be more different in their temperaments, interests, personalities, sexual orientations. You name it, they don’t share it. (They don’t even, confoundingly, share a hair color. Maybe the least believable thing about Orphan Black is that Helena, the feral, abused child of a fundamentalist religious order, would get a blond dye job.) But because of their intense circumstance, they are getting a crash course in how to be family: very dissimilar people bound together by blood, whether they like it or not. There is not a better performance—magic trick?—on television right now than watching Maslany break herself into a multitude that’s learning it might be one.